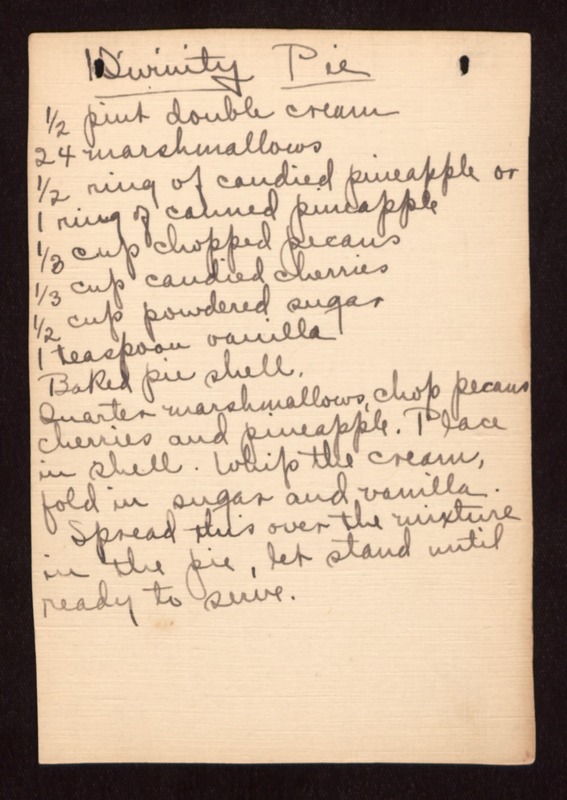 Divinity Pie 1/2 pint double cream 24 marshmallows 1/2 ring of candied pineapple or 1 ring of canned pineapple 1/3 cup chopped pecans 1/3 cup candied cherries 1/2 cup powdered sugar 1 teaspoon vanilla Baked pie shell Quarter marshmallows, chop pecans cherries and pineapple. Place in shell. Whip the cream, fold in sugar and vanilla. Spread this over the mixture in the pie, let stand until ready to serve.